I love income. And I’m not afraid to say it. How does it get better? 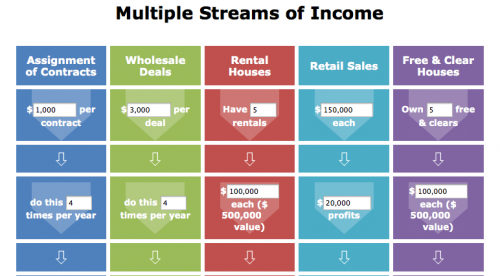 MULTIPLE streams of income! In our real estate investing business, we constantly talk about all the ways there are to make money – the multiple streams of income that we can produce. The best part of this idea is that, if one area isn’t working particularly well for a time, you have all the other streams flowing in! For your benefit, we posted our multiple streams of income calculator which we use to show the income from each stream over time based on various parameters. You can use this calculator, not only for totals, but to show how many transactions you must complete to create the income necessary to support the lifestyle you need (or want). Play with this calculator by plugging in your numbers to see how much income you can create (or have already created), and how to grow your income. 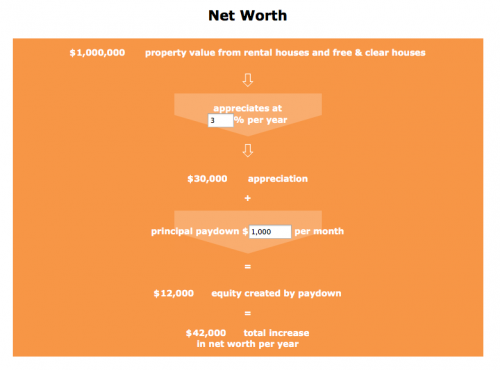 Next, look at the Net Worth Calculator to see what your net worth is and how it can grow. Are you happy with your results? If not, how are you going to change it? Are You an Investor or a Speculator? Do You Prefer Income or Wealth?